Why you shouldn't support the major festivals produced by AEG Live. As you've probably heard by now, it was recently revealed that the owner of AEG Live (the production company that hosts Coachella), Phil Anschutz, has a history as a leading sponsor of many conservative causes. Organizations that Anshutz supports include the Alliance Defending Freedom, the Family Research Council, and the National Christian Foundation. These three groups are known to campaign against LGBT rights, and the Family Research Council's website shows that it is specifically anti-LGBT rights, anti-trans rights, and anti-abortion. Additionally, the Center for Responsive Politics shows that Anschutz and his wife donated more than $1 million to Republican candidates and PACs during the 2016 campaign season. Although this is not the first time this information has surfaced about Anschutz, it seems to be the first time this information has gotten so much attention. 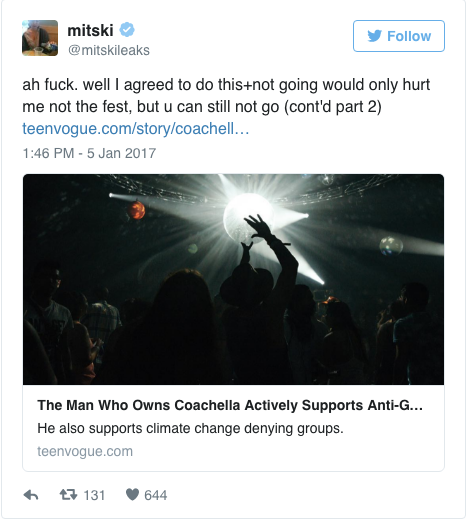 Initially broken through an article on Teen Vogue just as Coachella's 2017 lineup was announced, the news has vastly spread across social media, and has caused many to denounce their affinity for, or even attendance of, Coachella. She followed up by asking her followers, "if you're going w me, let's make sure the spaces we inhabit are made safe. ugh." "Both The Anschutz Foundation and I contribute to numerous organizations that pursue a wide range of causes. Neither I nor the Foundation fund any organization with the purpose or expectation that it would finance anti-LGBTQ initiatives, and when it has come to my attention or the attention of The Anschutz Foundation that certain organizations either the Foundation or I have funded have been supporting such causes, we have immediately ceased all contributions to such groups." This statement doesn't sit well - are you actually unaware of where your personal foundation and corporations are donating their money? That sentiment is very hard to believe. Additionally, if you personally are donating to Super PACs to support the far right candidates that ran campaigns in 2016, it's not hard to connect the dots and see that you support those exclusionary ideals. In this politically tumultuous time where minority groups across the nation are protesting and fighting for their basic human rights, it's more important than ever to boycott and make noise about corporations that do not have everyone's best interests at heart. As tough as this may be in terms of AEG Live - who is responsible for 61% of ticket sales worldwide in the third quarter of 2016 according to Pollstar - the least you can do to oppose the company's conservative agenda is to stop purchasing tickets to their festivals. The festivals they produce include Coachella, Panorama, FYF Fest, Edgefest, and dozens more. It's been proven that boycotts work. Make a statement this season and refuse to purchase tickets to any AEG produced festival. If they see slashed sales across the board, they'll have no choice but to change their tune.